Water, for all its teasing, fluid insubstantiality, can have a tight grasp. Get caught by the wrong current and the water might never let you go. And memory, as Narvik tries to demonstrate, works in much the same way. If you’re not careful, it’ll pull you under. 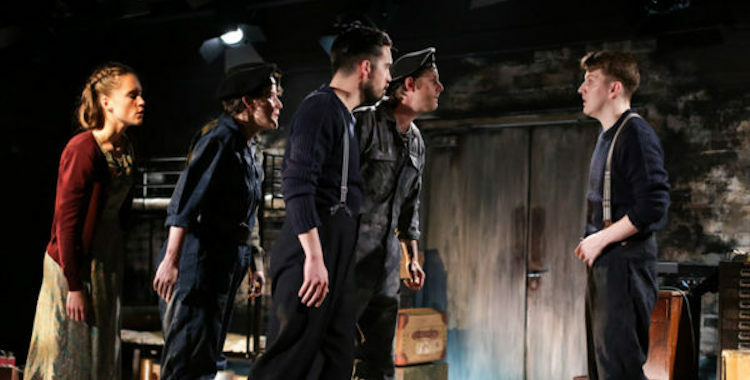 Lizzie Nunnery’s song-studded play revolves around one of the lesser known chapters of the Second World War: the role of the British Navy in the waters around German-occupied Norway. The focus is Jim (Joe Shipman), a Liverpudlian radio operator who starts out working on fishing boats and ends up on warships. Over the time-hopping course of this 80-minute show, we are shown his pivotal relationships with mysterious Oslo schoolteacher Else (Nina Yndis) and troubled fellow radio operator Kenny (Lucas Smith), as well as brief glimpses of the paternal influence that was abruptly cut off when his father abandoned him as a child. The shifting tides of time are cleverly accommodated by Katie Scott’s compact design of interlocking pipes, around which actors and a three-strong band duck and weave. Water – Jim’s home and Else’s phobia – is a constant suggested presence, invisibly rushing around them. The fraught shifts that Jim and Kenny spend listening out for signals, meanwhile, are lent a claustrophobic intensity by the metallic structure that hems them in, enhanced by Richard Owen’s moodily atmospheric lighting design. It’s just a shame that such intensity is lacking elsewhere in Hannah Tyrrell-Pinder’s production. Much of the play hinges on Jim’s romance with Else, a fleeting pre-war encounter that somewhat implausibly stokes a long-burning passion. After meeting at a dance in Oslo, where Jim is stopping over on a job, the pair embark on a fling that becomes a long-distance epistolary relationship. It’s Else, waiting for him somewhere across the icy waters, who keeps Jim going through the horrors of war. But there’s not a sufficient spark between the two to sustain the illusion of this long-held flame. We don’t see enough of the characters together to truly care about their relationship, while there’s more awkwardness than chemistry between Shipman and Yndis. And it doesn’t help that the early letter-writing sequences, which strive so hard to be heartfelt, are staged by Tyrrell-Pinder with a kind of stiff unease. Jim’s tumultuous friendship with Kenny is more convincing. Theirs is a relationship forged in the fear and forced intimacy of conflict, forever simmering with tension and occasionally boiling over. In some of the play’s strongest sequences, they wonder what it is they’re fighting for after all, and talk about the impossibility of those at home ever understanding the cold and the dread and the death. The framing device that holds it all together is what appears to be Jim’s own impending death, several decades later in the undignified surroundings of his basement. As he lies prone on the floor after a fall, the subterranean space slowly filling with water from the leaking pipe he was attempting to fix (another reference subtly absorbed by Scott’s design), wartime memories flood back to him. The result is neither clear enough to simply convey the story nor enigmatic enough to suggest the unexpected swirls and eddies of memory that the piece seems more interested in. The ‘man’s life flashing before him’ conceit is hardly novel and it’s weighed down by some laboured old-man-acting from Shipman, who’s better as the youthful dreamer. A more effective evocation of the past and its pull on us is the incorporation of music. Songs, as Nunnery and composers Vidar Norheim and Martin Heslop recognise, so often have the power to transport us back to long-forgotten moments. Yet even this soundtrack of haunting, folk-style tunes never feels quite as integral as it should, often chivvying the scenes along rather than working hand in hand with them. Perhaps unfairly, I left wanting more of what was concealed and less of what was shown. Else, who during the Nazi occupation makes a terrible compromise, strikes me as by far the most interesting character of the central trio. Yet we’re never allowed to glimpse her motivations or confront the bleak circumstances that make impossible choices possible. Though there’s something to be said for leaving things unexplained and unresolved, much of Narvik’s broad scope remains frustratingly obscured, while the snippets that do appear on stage too often fall short of the show’s compelling promise. Memory might be arbitrary, its currents taking us in unexpected directions, but here it fails to really grip. Photo: Alex Mead, Decoy Media.